Like the much-hyped Tupac Shakur hologram that debuted at the Coachella music festival,King of Rock and Roll Elvis Presley will get the virtual treatment by the same company that made the late rapper's lifelike hologram. Digital Domain Media Group, creator of the "holographic" Tupac Shakur has announced an exclusive deal with the Core Media Group to jointly produce a series of "virtual" Elvis likenesses for a range of entertainment projects. According to Digital Domain ,the virtual Elvis will soon be seen in film, on television and in other venues. Concerts appear to be a clear possibility. Digital Domain says it will announce soon where audiences can expect to see the first virtual Elvis performances. 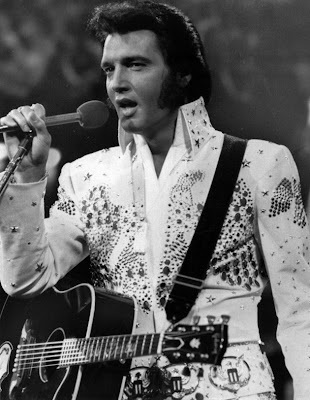 The King of Rock 'n' Roll remains one of the most popular figures in music despite his death in 1977.